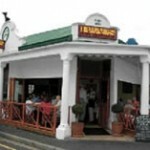 Brad’s Grill in 2nd Avenue, Harfield Village, Kenilworth  671 2527, is a hugely successful restaurant because of – well Brad! He’s been there for 30 years and he plays to his audience to perfection and he’s just always there. His meat is superb – he told us that his brother is in the meat business so he has an inside track on top quality perfectly matured. Grilled with little marinade, the flames being hot enough to caramelise an edge on the fat. Served with onion rings which are the size of a giants napkin ring carved out of beechwood, crispy crunchy fries and always delicious pumpkin puree and Swiss chard served ‘en branche’ as I was taught at cookery school in London. That said, Brad’s fish and chicken are wonderful, prawns superb and his oxtail is the stuff of which legends are made. His wine list is unpretentious, eclectic, well priced and there are food and wine specials up on a blackboard. Often we do take outs and at times do the early bird special – in by 6 out by 8 and you get plates of deep fried calamari, chicken schnitzel or sirloin with chips or baked potato and vegetables, all priced for great value. Please go there, tell him I sent you and watch his face light up in a benevolent smile – he’s a great raconteur and has wonderful waitstaff. The perfect suburban family restaurant, though you’ll often see country rugby fans there on Saturdays, many a Springbok, a Stormer and their oppositions, bridge girls there on Wednesday and the whole family there – often.